The works of Zhang Da Wo (張大我/Chang Da Wo, b. 1943) directly relate to the insecurities and possibilities of a new Chinese calligraphy. While his works are often totally illegible, it is clear from their titles as well as their technique that they are intended to engage with the calligraphic tradition. 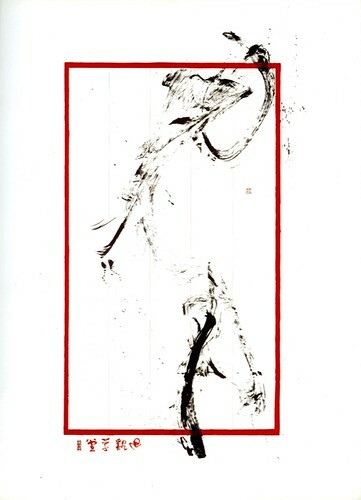 In his work ‘Dragon’ (1994), for instance, the sparing use of black ink on white paper, the expressive lines and dynamic composition all clearly place the work in the field of ‘calligraphy’. Yet, the explosion of the composition right off the page, the essential illegibility of the work and the subtle ink tones and treatments assure the viewer that all is not as it once was. Zhang has also played with audience expectations by housing his compositions in (or around) a frame that invites the native Chinese reader into reading the work as text. As Chinese people are educated to write within frames, works such as “Letter” (2001) deliberately disrupt even the most fundamental expectations of the viewer, providing a red frame from which the black ‘characters’ deftly escape. The works of Pu Lie Ping (蒲列平/P’u Lieh P’ing, b. 1959) are even more difficult to classify. Having often made use of materials other than ink and paper, one must sometimes struggle to understand his abstractions as calligraphy. Despite this, works such as “Dreams” (2000) retain a structural use of line and form that lends itself to the calligraphic tradition even if the colorful compositions suggests anything but. Moreover, the professed allusions to a classical poem by Li Bai suggest a kinship with and challenge to the literati mode. Works such as “The Future is Bright, but…” incorporate ancient pictographs into a textured, abstract composition, evoking the innumerable layers of history, as well as the future potential, that belong to the Chinese culture. Wei Li Gang (魏立剛/Wei Li Kang, b. 1964) seems to effortlessly express the limits and the potential of the calligraphic form. His compositions are, like Zhang’s, often materially linked to the calligraphic tradition in a clear preference for ink and paper. Yet, like Pu, he invites new colors to liven his pieces and set expectations on edge. Most strikingly, perhaps, is his insistent reference to the rhythm of Chinese calligraphic compositions. In his “Wisteria Sinensis” (2000), Wei provides a series of forms whose relations to one another is clearly evocative of the traditional writing mode. Upon looking at it, one who is familiar with Chinese calligraphy cannot help but attempt to ‘read’ it in the familiar manner even though there are no characters there to decipher. His rapid movements through texture and line provide us with the aesthetic sense of appreciating calligraphy without the need to decipher linguistic meanings.